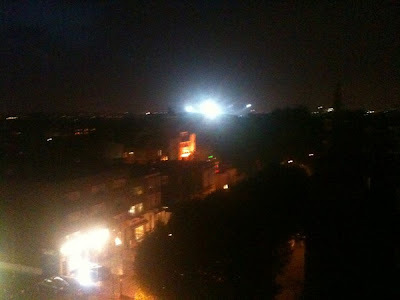 Last night was a bizarre night in Shepherd's Bush and all because of a football match. Before I go any further I should explain that I am a true and sympathetic football fan.I have to be because I am an Everton supporter. I have been to football matches all over Europe (not supporting Everton as that doesn't happen very often) because I like to experience the atmosphere and because I genuinely appreciate good football and sharing this with good football fans. Growing up I was also a season ticket holder and Crazy Gang member at Wimbledon FC (RIP), and after living in Italy I became a regular at the Stadio San Paolo in Naples so I am no stranger to "lively" football matches. 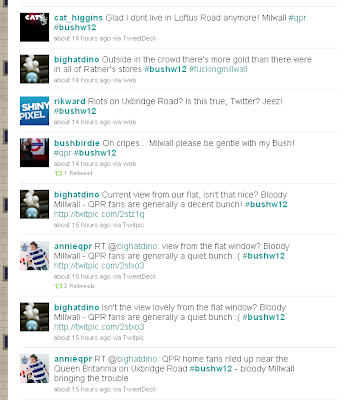 However I am yet to go to a QPR home game but it is on my ever-growing list of Bush things to do. Last night Millwall came to Loftus Road, and their fans seemingly invaded the surrounding pubs and roads. According to the good tw'eople who were witnessing it all first hand, from as early as 4pm there were police vans, dogs, riot squads and a helicopter accompanying up to 100 officers surrounding many of the notorious pre-match pubs. As 8 o'clock kick off approached it was reported that many pubs and shops decided to close and so potentially clashing fans spilled out on to the streets of Shepherd's Bush, mainly in the Uxbridge Road area. 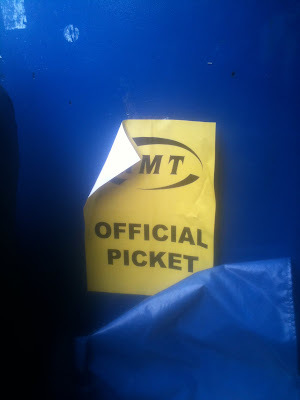 I was actually sat at my office desk near Bank station where I was working late while this all unravelled. I have to admit that when emerging from the tube in Shepherd's Bush a few minutes before 8pm I was expecting a scene of blood and devastation and at least one policeman to greet me at the station. Instead there wasn't a plod in sight and the usual commuters were rushing home and the tired and poor looking shoppers were lugging their bags home from Westfield. And then I heard the sirens, and I saw the bottle neck traffic going nowhere towards Uxbridge Road. However these are not unusual things in Shepherd's Bush. I wasn't there so I can't comment, but I can say that for nearly 4 hours my twitter feed was full of quite startling reports of chaos and drama and a much heavier than usual police presence, and we are not a pocket of London where police are strangers. It's not my intention to point the finger at Millwall and their long-standing reputation. There were reports from QPR that trouble had been stirred up early by the Ultras in town "supporting" Marseille in their Champions League clash with our Fulham neighbours Chelsea. But I am sad that so much of the perpetually stretched Metropolitan Police's resources were so heavily absorbed in our corner of London yesterday, but I am not going to pretend that I don't acknowledge and even appreciate how passions run high when it comes to football. That said, it's a very different breed of football "fan" who resorts to violence and chaos. Whenever QPR play at home I always notice (and avoid eye contact with) the many tattoo-ed fierce looking men in their Hoops shirts. There are, however, just as many, if not more, families that religiously and optimistically head towards Loftus Road on a Saturday afternoon. This is what I was thinking about last night - the young girls and boys who may have got caught up in it all last night and that's when any kind of report of violence and rioting really does concern me. A year ago on Saturday I began this blog. The aim was to document bits and bobs about me and my experiences of living in Shepherd's Bush. I wasn't quite sure where it was going to go or how long it was going to last (or on reflection how many dates I'd go on or how many Bagel Bites I'd eat) but if I'm honest only a small part of me expected it to still be going after 12 months. Nor did I anticipate how much I would enjoy it. 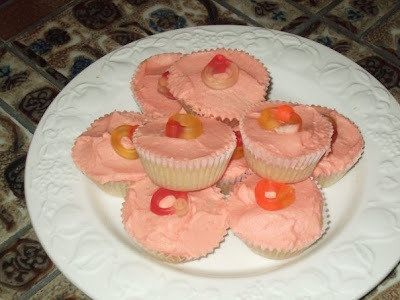 To celebrate I will be eating home made cakes like these and I'll be writing a long list of things I wanted to blog about a year ago that I still haven't. Because I now have at least three readers I would also like you to leave a little comment telling me what in the Bush (and beyond) I should go see, go do, go eat, go experience and then I will blog about it. A few months ago I did something that I've long wanted to do in Shepherd's Bush, and quite frankly should have done by now. No, it wasn't suggesting the Green's super strength crew swap cider for Appletise, nor was it downing a pint in one of the many intimidating, but equally as intriguing, QPR pubs. 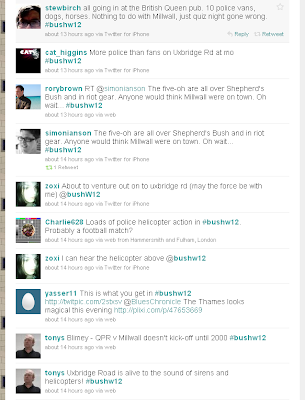 It was in fact going to the theatre; Bush Theatre. I purposefully haven't blogged about him much but NewMan and I don't have many things in common, and the theatre certainly isn't one of them ("Are there robots in this play?" I believe was his first answer to an invite), but somehow in this very special beginning phase when we are both open, or at least pretending to be, to each other's differing interests, he agreed to it. 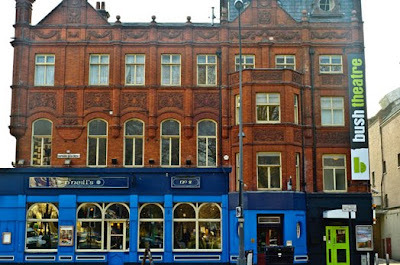 The Bush Theatre began in the most traditional of ways, in a room above a pub. Slightly less traditionally apparently the room was also once used as Lionel Blair's dance studio (oh the jazz hands!). In nearly 40 years the theatre has become a breeding ground for new talent, both in terms of writing, directing and general thespian creativity and has welcomed many big names into its small but perfectly intimate performing space. It was personally lovely to learn from the Theatre's history that Victoria Wood wrote her first sketch on a type writer she found in the theatre and then performed it there with one of my heros, Julie Walters. Perhaps I should explain that if I had thicker skin and better teeth I would have pursued my childhood dream of becoming an actress. Instead I have a proper job (which admittedly I love), though a life long passion for theatre which needs attention every now and again remains. Back then when I was blissfully ignorant and chasing this dream studying Theatre Studies at sixth form college we used to rehearse in a space not dissimilar to the 81 capacity Bush Theatre, so it was a nice flashback to a creative time in my life. NewMan and I went to see Like a Fishbone by Anthony Weigh. The play is essentially about an event that has already happened, a shooting in a small town school. Set in the office of an architect who is commissioned by the town to devise a suitable memorial to those who died, she is confronted by the extremely Christian mother of one of the children who died. The play and performance actually got slammed (I believe that's the correct terminology) by the critics and I went to watch it having already read the reviews, but craftily keeping them from NewMan, who I could tell was absolutely doing this to gain new boyfriend bonus points. There were elements to the play that lacked conviction and indeed certain moments in the play went from subtle and effective dialogue to quite cliché-heavy discourse, but I had to applaud both the consistent and on the whole convincing lead performances by Deborah Findley and Sarah Smart and I have to thank Phoebe Waller-Bridge in her amusing supporting role which kept NewMan entertained. I left the Bush Theatre feeling like I'd enjoyed the play but best of all like I'd joined a fairly secret club of Bush Theatre go-ers who share something quite special. Here comes the serious bit. Bush Theatre relies heavily on donations to keep fulfilling it's goal of giving new playwrights a platform and I have to say one visit to this local slice of culture I am convinced it's a worthy cause. Bush Theatre has also been occupying the charming building that used to house Shepherd's Bush library and has been doing on-off events there with the help of volunteers. Not only is this a sign of culture in the area, it's also a strong indicator of community being alive and well in Shepherd's Bush. And at a time when funding for the arts is under an increasing threat, I for one am happy to support this. Last Monday and Tuesday London and Londoners were forced to enter into a bizarre survival mode. As we marched through the more crowded than usual streets and queued for buses or thanked St Boris for his bikes I must have been in a minority in thanking Bob Crow and his comrades for forcing an opportunity on me to enjoy a long walk home from east to west London. So after double-bowing my trainer laces I left the Bank of England behind me and commenced upon the 6 and a bit miles home. My twitter friends will know that I am currently trying to master this distance at a respectable jogging pace but on this particular day I'd already attempted (died on my backside) to run the distance in to work that morning so a Harold-from-Neighbours-esque power walk home it was. Though I've lived in and around London for the last 15 years I am still in awe of some sights and buildings I see. St. Paul's Cathedral is one of them. Unfortunately as I'm now becoming used to pounding the pavements of Tottenham Court Road and Oxford Street to lose lbs as opposed to £s, these particular sights do not amaze me, they more frustrate me and make me walk/run with my elbows pointed out at an angle. And on this odd Tuesday evening I wasn't alone as cyclists, buses, pedestrians, cabbies and motorists fought to move forward through the West End. So as I approached half way home I therefore greatly appreciated the peace and perfectly timed sunshine that greeted me in Hyde Park. I had settled into quite a decent bum-wiggling pace and wasn't at all tempted to join this queue for the 148 bus. I am sure that it won't last, but I still count myself lucky that I can include a walk, run or cycle through Hyde Park into my daily commute. A year ago I was commuting west out of London and there is no way you can compare chugging along the M4 corridor to strolling past the Serpentine. Admittedly by the time I emerged from Hyde Park into Notting Hill where it seemed people had abandoned queuing for drinking and eating, my legs and feet were starting to hurt but as I always do when running this route, I chanted to myself that it was all downhill from here and indeed it was. After one hour and 47 minutes (or two Jill Scott albums and one DJ Marky podcast) I was sat on my sofa and inspecting my walking injury, a vicious toe blister! I am confident that very few people got home that day feeling like they'd experienced a silver lining to the cloud that was the tube strikes, but I did and have decided to take this long walk more often (but maybe with some trusty Elastoplast and my oyster card in my pocket, just in case).